Great meals & the time to enjoy them! Imagine coming home to a refrigerator full of home-cooked meals prepared just for you. No more grocery store lines, no more scurrying to get dinner on the table, and no more take-out! 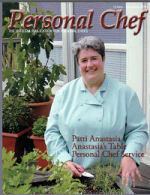 Anastasia's Table, LLC is Personal Chef Service that does all of the menu planning, shopping, cooking, and cleaning up for you. You get to enjoy home-cooked, delicious, and nutritious meals, but I do all the work for you. Need help with a special diet? I can prepare delicious meals for gluten-free, SCD (Specific Carbohydrate Diet), low carb, ketogenic, food allergies and intolerances, weightloss and maintenance programs, low-sodium, heart healthy, diabetic, organic, vegetarian, vegan, and other special diets. It all starts with a consultation in your home to assess your needs. We'll talk about the foods that you enjoy, any allergies or dietary restrictions, how you'd like your meals packaged, how often you want to eat meals prepared by Anastasia's Table, and more. I plan your meals to include only foods that you love, prepared exactly to your tastes. Shop for fresh, quality ingredients. Cook, package, and label your meals, all in your kitchen. © 2017 Patti Anastasia and Anastasia's Table, LLC. All Rights Reserved.